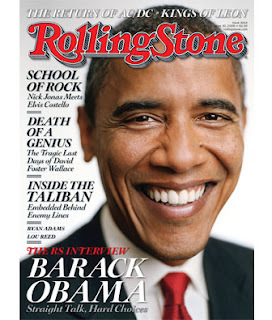 Pop Culture Junkie: Rolling Stone got a makeover! Rolling Stone got a makeover! Got home and saw the newest issue of Rolling Stone in my room. At first, because of the size I assumed it was some sort of election special issue. But no, it's a new format and I LOVE IT! Rolling Stone has gone from an oversized staple bound, crappy paper magazine to a smaller, perfect bound, really nice feeling paper magazine! I will definitely be carrying Rolling Stone around a lot more with me now. It's so much more portable! They have also added more pages to bulk up each section! Apparently last summer they produced an issue in this current size and sent it to 3,000 subscribers to see what people thought and people loved it. I definitely have to agree, this is a great move on their part! They even mentioned using a adhesive sticky address label instead of printing onto the cover itself. I'm a total dork for details! Any Rolling Stone readers out there? What do you think of the change? Wunderbar idea! Ids it jsut me or does Obama look different? A weird camera angle/lense? Anyone? DOn't ge tme worng, I like him...but this looks strange. Nope. Not a zine reader. But i really don't like that photo. Makes him looks, I don't know, stupid? k and/or k and j. kaye- It's definitely a special lens. My guess would be either some kind of wide angle lens or fish eye lens. I like wide angle but maybe not for someone's head!